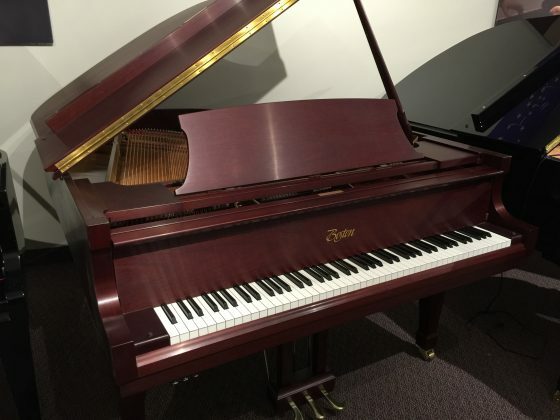 Designed by Steinway & Sons, Boston pianos have provided a perfect niche for pianists desiring a professional-level piano priced in the middle range. Including key action modeled geometrically after Steinway’s patented Diaphragmatic Action, precisely tapered soundboard & wide-tailed design, the Boston piano is a result of more than 150 years of Steinway & Sons experience combined with advanced manufacturing expertise. In Mahogany Satin, this impeccably cared for parlor grand piano projects a bold, Steinway-like tonal quality. The action is fluid. A matching duet artist bench provides both elegance and comfort. When selecting a Boston Grand Piano, one will discover that a brand new GP178 is currently listed at $33,600, making this like-new grand piano an amazing opportunity at $21,900.